A Texas State University student is taking social media by storm with the way she's responded to losing her license and car after a DWI. According to MySanAntonio.com, Tara Monroe's license was automatically suspended after she refused a breathalyzer test when she was pulled over after a concert. The 20-year-old's father was none too pleased with the DWI and took away her car, according to the report. Monroe didn't want to ride a bike around campus, so she found a battery-powered Barbie Jeep for sale on Craigslist. 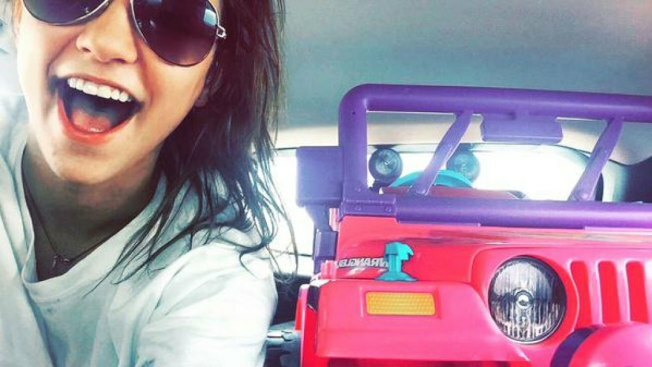 She bought it for $60 from a little girl named Charlene and aptly named her pink Barbie Jeep "Charlene." Students have since taken to social media posting photos and videos of Monroe driving around the campus. Monroe, who was arrested March 4 with a $3,000 bond, said she wasn't surprised by the attention. In fact, she welcomed it. While Monroe is getting her "15 minutes" others are just happy her drunk driving didn't end in "tragedy." “We’re glad that she’s ok and her parents are taking the issue seriously. This is an example of some of the consequences that come with drinking under the legal age of 21. Fortunately it didn’t end in tragedy.” Amy George, Mothers Against Drunk Driving senior vice president of marketing & communications, told NBC Owned Television Stations in a statement. The San Marcos Police Department wasn't immediately available for comment. Editor's Note: This story has been updated to correct the name of the organization Mothers Against Drunk Driving.